As you know, I love cases of seasonality. 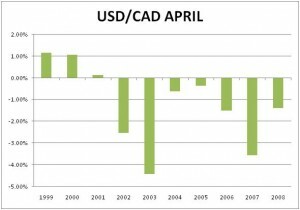 In the month of April, the strongest case of seasonality in forex can be found in USD/CAD. 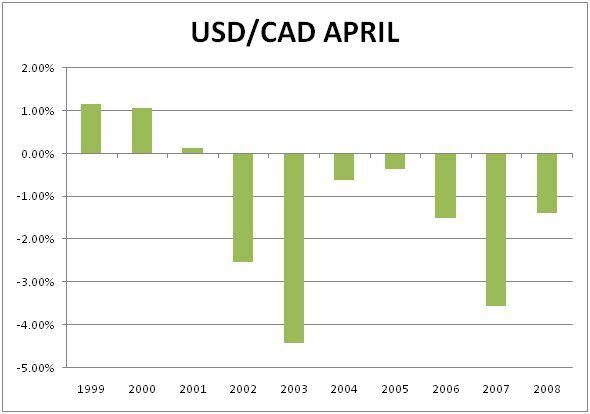 In 7 out of the past 10 years or 70 percent of the time, USD/CAD has fallen in the month of April. Take a look at the eerily strong pattern in the chart below. Unsurprisingly we are beginning to see USD/CAD repeat this pattern in 2009. There is also seasonality in the AUD/USD. ← Dont Stop Me Out!